The indispensable Matt Walsh with yet another post of why a Donald Trump presidency would not make America great again. Quite the opposite in fact. I hope if you've been paying attention these past few days, you're beginning to understand my position, and why I've been so forceful, consistent, and aggressive in my advocacy of it. Many of you already understood, but certainly there are many others who still need to figure it out. In just the last couple of days, Donald Trump has promised reprisals against his critics when he's elected president, pledging to "open up" libel laws so that he can punish anyone who writes "negative" or "false" stories about him. He said his critics "will have problems" when he's in power. Remember, Trump claims that EVERY critique of him, no matter how true, is "false," so he is clearly vowing to outlaw all criticism of government. If Obama had said anything even remotely in the neighborhood of this when he was running for president, every conservative in the country would've exploded with rage (justifiably). But Trump said it and it hardly sparked much of a backlash at all. Then Trump proceeded to retweet a quote from Benito Mussolini, the Fascist dictator, and later admitted that he knew the quote was from Mussolini but decided to distribute it anyway. To be clear, for anyone who isn't versed in recent world history, quoting Mussolini is exactly morally analogous to quoting Hitler. It would be like Trump finding a passage in Mein Kampf and sympathetically reading it at one of his rallies. Finally, this morning Trump refused to repudiate David Duke and the KKK. Later on Twitter he backpedaled, but when asked on TV if he would denounce the white supremacists who've endorsed him, Trump dodged. He was pressed specifically on denouncing the KKK and he refused. The KKK, people. Donald Trump was reluctant to say, "Yes, obviously I disown the KKK and object to everything they say and do." Initially Trump avoided the question by saying he has to investigate the KKK to figure out if he agrees with them or not. Now, guys, this was all in the span of just three days. And it should be noted that a great number of his fans cheered him on when he promised to censor speech and defended him when he quoted Mussolini and refused to criticize white supremacy. I said last week that the scariest thing about Trump is that he's running as a tyrant, unabashedly so, and his fans want him BECAUSE of it. His fans are explicitly asking for Trump to rule as an emperor. They don't desire freedom or liberty anymore, and they don't give a damn about the Constitution. What they want is a political Strongman who will "restore America's greatness" through brute and oppressive force. I should remind you, historically, this plan has never worked out well for the common man. Just ask the folks who lived under Trump's mentor in fascist Italy. We are watching our nation march headlong into tyranny and despotism, and the cattle following along are quite aware of, and enthusiastic about, where the cattle train is going. While Trump will not repudiate white supremacy, his fans have indeed repudiated freedom and independence, and are desperately asking their Great Master to subjugate them for the good of the country. It's madness and it must be stopped. If you can't see that now, you never will -- until it's too late. What's sad is some Trump-kins don't even dispute the fact the guy's emanating fascist rhetoric. As long as he's enacting the proverbial burning down of the Republican "establishment," it's all good. My friend and Northern Alliance Radio Network colleague Mitch Berg is out on assignment today, so I will be taking the reins of The Headliner edition of the NARN. The 2-hour extravaganza beings at 1:00 pm Central Time. 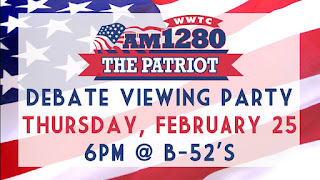 At 1:30, Salem Media Group-Twin Cities GM Nic Anderson will call in to promote a yuuuuuge (**throwing a quarter into the Donald Trump royalty jar**) event being put on by AM 1280 The Patriot next month. What is it? Well....you're just gonna have to tune in. Finally at 2:00 I will be joined in studio by Melissa Sauser. Upon the announcement that MN state senator Dave Thompson would not seek reelection in 2016, Melissa chose to vie for the Republican party endorsement in Senate District 58, located primarily in Dakota County. In the rare non guest segments I may recap the donnybrook that was Thursday's GOP presidential debate as well as look ahead to Super Tuesday. So please give me a call at (651) 289-4488 if you'd like to weigh in on any of the topics I plan on addressing. You can also text comments/questions to (651) 243-0390. You can listen live in the Twin Cities at AM 1280 on your radio dial. In and out of the Minneapolis-St Paul area, you can listen to the program on the Internet by clicking this link, or check us out via iheart radio. Even though I have a face for radio, there is a UStream channel where you can watch the broadcast, if you so desire. Check it out here. And if you're so inclined, follow along on Twitter at #narn or "Like" our Facebook page. There's no question that Donald Trump is in the proverbial driver's seat when it comes to the race for the Republican nomination for President. There's a lot of reasons why Trump has lead comfortably throughout, not the least of which was formidable candidates like Ted Cruz and Marco Rubio being unwilling to engage him on a consistent basis. While Cruz has been willing to call out Trump when out on the campaign trail, Rubio has seemingly focused most of his invective towards Cruz and very little (if any) digs at Trump. 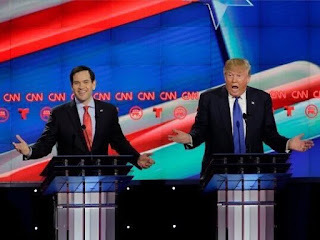 But that ended in Thursday night's debate as Rubio (who has had many solid performances and one forgetable one in previous debates) hammered away at Trump in a way that clearly rattled the billionaire businessman. The natural question to be asked is where was this six months ago? It's been very obvious to those who think rationally that Trump is a boorish empty suit with no substance and no ideological convictions. The fact Rubio and Cruz finally hit him with that ten debates into this election cycle smacks of a "kitchen sink" strategy. To me the highlights of the evening were Trump being exposed as the utter fraud many have known him to be. Earlier this week Trump insisted that as President he'll be "neutral" on the Israeli-Palestine conflict, only to say Thursday he'd be Israel's biggest supporter. He then talked about supporting Planned Parenthood but then indicated he would defund it. He also talked about how removing Libyan leader Muammar al-Qaddafi was a mistake but only after he thought it was a swell idea in 2011. But perhaps the gem of the evening was when Rubio got Trump so flustered when discussing health insurance reform that Trump repeated the same vacuous talking points over and over. And Rubio (who had been accused of repeating himself by Gov. Chris Christie in the New Hampshire debate a few weeks ago) pounced on that. Not to outdone, Cruz pointed out the tremendous amount of money Trump poured into the campaigns of liberal members of Congress, all of whom were soft on illegal immigration. The idea being that someone like Trump being so adamant against illegal immigration with his rhetoric doesn't square with his actions. Oh yeah, Gov. John Kasich (R-OH) and Dr. Ben Carson were on stage too, though you'd hardly know it. I believe Kasich is merely hanging around at this point in an attempt to convince the GOP nominee to allow him to be the VP candidate on the ticket. Kasich has a little leverage, as a candidate has not won a presidential race without winning Ohio since John F. Kennedy in 1960. As far as Carson, I can't tell you why he's still in. Again, he's a wonderful man with an inspiring journey from impoverished kid to renown neurosurgeon, but he's just not presidential material. To summarize, I believe this was Rubio's best performance, it was Trump's worst and Cruz was very solid (but he still makes me boil with anger over the continued misuse of the word "amnesty"). So does this mean Trump is suddenly vulnerable now? Sadly, I doubt it. If you followed this debate on social media, the Trump supporters (and Trump himself) are so firmly entrenched in an alternate reality that if he defecated on the stage on live TV, his supporters would probably say something like "The GOP 'establishment' has been doing that to us for years, so it's a perfect metaphor." Regardless, Rubio and Cruz did exactly what they needed to do if they are to have any hope of slowing down the Trump juggernaut. It sure would have been nice had this strategy been implemented months ago. So are you planning on checking out tonight's GOP presidential debate? 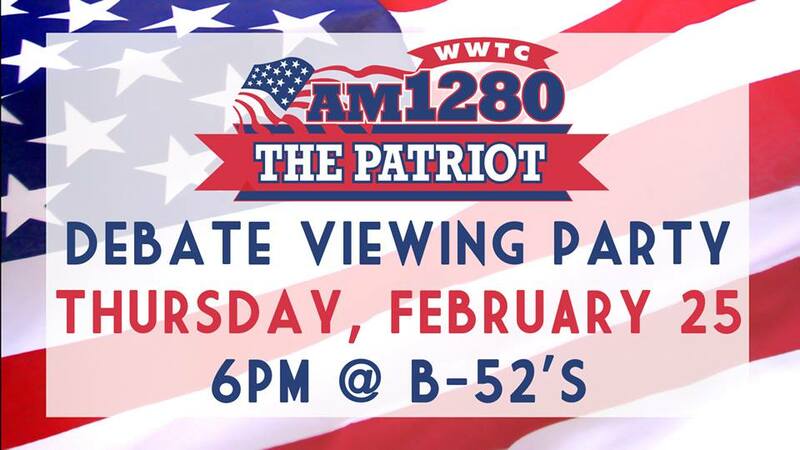 Well, since AM 1280 The Patriot is the only Twin Cities radio station carrying the debate (due to Salem Media Group's own Hugh Hewitt being one of the moderators), we've decided to put on another debate viewing party! The festivities, co-hosted by my AM 1280 colleague Mitch Berg and I, will take place at B-52 Burger & Brew in Inver Grove Heights. We'll get started at 6:00 pm, which will allow ample time to socialize as well as indulge in some food and beverages before the main event gets going at 7:30. Thus far this campaign season we've had two debate parties, with both being over capacity. As such, the earlier you arrive, the better. Mitch and I absolutely love the fellowship we have with our listeners so we hope you can come on out! For purposes of full disclosure, I will be caucusing for Marco Rubio for President next Tuesday. Certainly Rubio has his detractors, with criticism often being rooted in his being part of the "Gang of 8," or that he is merely the GOP equivalent of Barack Obama, etc. Of course the most prolific charge levied against him is he is a "robot" and that he is incapable of diverting from specific talking points or is unable to be speak "off the cuff." My friend and fellow political junkie Ann Neu had the perfect retort for those who believe Rubio merely spouts talking points. I've heard a lot of criticism of Rubio repeating himself. It's called message discipline, and it prevents 47% and binders of women comments. The "47%" and "binders full of women" comments were put forth by 2012 GOP presidential candidate Mitt Romney. While it's difficult to say if those missteps were the the catalyst for Romney's failed presidential run, those statements certainly dogged him throughout the rest of his campaign. In short, "message discipline" is not a bad thing. In fact we're coming to find out it can be vital. Just ask current Republican presidential candidate John Kasich. To be clear, I don't think Kasich is some sort of misogynist for making such a statement. But the fact of the matter is Kasich had to answer for that statement thus resulting in his campaign releasing a response. "John Kasich’s campaigns have always been homegrown affairs. They’ve literally been run out of his friends’ kitchens and many of his early campaign teams were made up of stay-at-home moms who believed deeply in the changes he wanted to bring to them and their families," Rob Nichols, a spokesman for the campaign, said in the statement. "That’s real grassroots campaigning and he’s proud of that authentic support. To try and twist his comments into anything else is just desperate politics." As the saying goes: "If you're explaining, you're losing." What makes satire most humorous is when there is a grain of truth to it. Case in point: Back in April of last year, Bruce Jenner, the renown male decathlete who dominated the 1976 Olympics, was the subject of an in depth interview on ABC. The buildup of this TV event was rumored to be Jenner making it official that he was undergoing a significant "transformation." 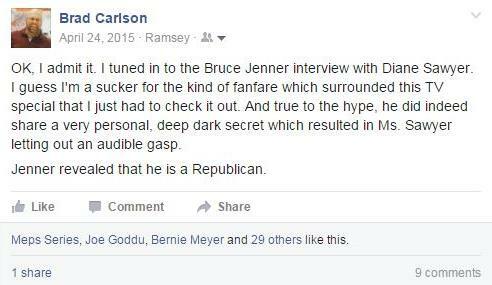 Obviously I was being tongue-in-cheek here since Jenner's big revelation was that "for all intents and purposes, I am a woman." But in truth, I sensed that evening that more people were shocked by Jenner's political leanings than the fact the most dominate male decathlete of the '70s considered himself a woman. Again, the satirical nature of my post definitely had a remnant of truth to it. The I Am Cait star appeared in front of a sold out house of students Wednesday night and U. Penn students didn't hold back in asking important questions. In response to one student who asked Caitlyn why she doesn't belong to a more liberal political party, the 66-year-old E! 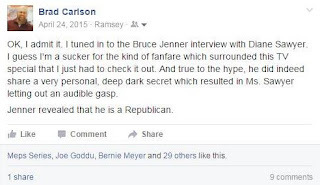 star replied (via a local Philadelphia blog), "I have gotten more flack for being a conservative Republican than I have for being trans." This past Saturday evening, blogger Matt Walsh summed up Donald Trump's win in the GOP South Carolina presidential primary far more articulately than I could ever convey. Trump won South Carolina, a supposedly conservative Christian state, by a wide margin tonight. - Don't rationalize this. He didn't win because of Democrats. The man won Evangelicals. The man who -- JUST THIS WEEK -- praised Planned Parenthood, and who fishes for applause lines by cussing out his competitors and mocking disabled people, and who can't name a book in the Bible, and who said he doesn't need forgiveness from God, and who brags about sleeping with married women, and who said he'd love to date his own daughter because she has a hot body, and who supported the murder of fully developed infant children, and who blatantly lies and then lies again about lying, and who has encapsulated literally the exact opposite of anything that could remotely be considered a "Christian value," won with the indispensable assistance of Christians. The anger I feel towards those Christians in this moment cannot be put into words. They should be ashamed. I will pray for them. - Speaking of winning conservatives, Trump -- JUST THIS WEEK -- said he likes the Obamacare mandate. This was, according to conservatives, the most important thing to defeat not but two years ago. Now some of those same conservatives are voting for a big government liberal who says he supports the very thing these very people were sure would undo the Republic just a few months ago. - If Trump wins the nomination, conservatism in this country is officially dead, and the country itself will be close behind it. - Speaking of the country's demise, Trump fans are gleefully ushering in tyranny. I am tired of hearing about their "anger." They claim they are angry at the very thing they now embrace. They aren't angry. They're bored. They're immature. They're infatuated with celebrity and fame and money. They aren't angry. I'm angry about what they are doing to my nation. The rest of us can be angry, but these people have lost the right to have their anger taken seriously. - I don't want to hear about second place consolation prizes. If Cruz or Rubio can't win South Carolina, it may be time to panic. I'm sorry, but it's true. Deal with the reality, folks. - According to exit polls, Trump fans don't necessarily think he's electable and they don't believe he shares their values, but "they want change." Dear God, we are really doing 2008 all over again. People voting for ambiguous, non-specific change in spite of the avalanche of red flags. We are really doing this again. I am so disgusted at the stupidity in this country. - Bush should be commended for dropping out. He's an honorable and decent man, although I didn't support him. The others in the bottom tier, should they stay in, will be doing potentially irreparable harm to this country and my children's future. And that is something I will struggle to forgive. - Get on your knees and pray for this country tonight. Right now. I feel we are on the cusp of something terrible. Pray we avoid it. I've been hearing for some time this country is on the brink of ruin. Some may suggest we're already there. But if you believe what is written in the Holy Bible, this world is not our home anyways. While I am fascinated by the theatrics and human behavior which accompany this country's political system, I've been careful to not make candidates into false idols. For me, it's pretty easy to avoid that temptation with a charlatan like Trump. The presidential race and the weather are both heating up, so tune in today to my Northern Alliance Radio Network program The Closer. The 1-hour festivities begin at 2:00 PM Central Time (weather forecast included). I'll obviously look back at yesterday's GOP South Carolina primary and Democrat Nevada caucuses. It's also been an interesting week in the battle over the recent U.S. Supreme Court vacancy, where many Democrats and their supporters have exuded stunning displays of ignorance and hypocrisy. At 2:30, MN state senator Michelle Benson will stop by to preview the upcoming legislative session. Among the items to be broached will be MNsure, transportation, what to do with the budget surplus, etc. If you started to ask yourself "What more bizarre happenings can possibly take place in these presidential campaigns?," could you imagine the answer being "Well, the GOP front runner could engage in a war of words with the pope?" Yet that's where we find ourselves. Pope Francis may have picked a fight with the wrong bully. After months of taking subtle swipes at Republican politicians, the pontiff went for a direct punch at Donald Trump on Thursday, suggesting the GOP poll leader is “not Christian” because of his desire to build a massive wall along the U.S.-Mexico border. And Trump, practically pre-programmed to counterpunch, fired off a withering retort. He not only called the pope’s comments “disgraceful,” but he also suggested that the Islamic State would find the Vatican to be a mighty fine target. The back-and-forth between the spiritual leader and the crass candidate was stunning, even for this rule-breaking presidential cycle, and once again thrust Trump to the fore of the news cycle as the GOP field scrambles to make its last impressions before Saturday’s South Carolina primary. As we've learned from Francis's prior commentaries, he is very nuanced. So when he says here that "A person who thinks only about building walls, wherever they may be, and not building bridges, is not Christian. This is not in the gospel," I don't believe he was talking exclusively about a literal wall between Mexico and the United States. I'm more inclined to think it was a symbolic talking point about Trump's inclination to be so divisive as opposed to reaching out to others. With all that said, I do take issue with the pope's judgmental tone in which he suggests Trump is "not a Christian," a charge which Trump definitely was not going to let go unanswered. "For a religious leader to question a person’s faith is disgraceful. I am proud to be a Christian and as President I will not allow Christianity to be consistently attacked and weakened, unlike what is happening now, with our current President. No leader, especially a religious leader, should have the right to question another man’s religion or faith." If Trump really believes what he says in that statement, that no leader (particularly someone seeking to be leader of the free world) should question the faith of another man, he might wanna take that up with.....er.....himself. How can Ted Cruz be an Evangelical Christian when he lies so much and is so dishonest? In perhaps one of the best retirement announcements I've seen in pro sports, NFL defensive end Jared Allen calls it a career. In 12 seasons, Allen amassed 136 quarterback sacks, which is good for ninth on the all-time sacks list (tied with Julius Peppers). Of eight players with more sacks than Allen, six are members of the Pro Football Hall of Fame with a seventh (Kevin Greene) slated to be inducted into the HOF this summer. I believe Allen will make the Hall one day but I doubt it will occur in his first year of eligibility. Half of Allen's 12 years in the NFL was with my favorite team, the Minnesota Vikings. In those six seasons, Allen had his most productive years with 85.5 sacks in that time span. His 22 sacks in 2011 was the second best single season total in NFL history. In April 2008, the Vikes paid a hefty price tag (a first round draft pick, two third rounders and a sixth rounder, all in '08) to acquire Allen and a 2009 6th round draft pick from the Kansas City Chiefs. However, it was a risk which paid off. Many forget that Allen was arrested for driving under the influence three different times from 2002 thru 2006. Despite those red flags, the Vikings insisted they performed their due diligence and thus gave assurances that Allen's troubles were behind him. In six seasons in a Vikings uniform, he never once had any high profile off field incidents. Thanks for the memories, Jared! My friend and MN state senator Dave Thompson beautifully conveys everything I've found objectionable about presidential candidate Donald Trump. For my money, the following perfectly encapsulates why the Trump phenomena is nothing more than a cult of personality. No other GOP candidate could get by with what Mr. Trump does. Can you imagine if video footage emerged showing Governor John Kasich advocating for a single payer healthcare system? His polling numbers would drop into the statistically insignificant range over night. Sometimes I think Donald Trump could congratulate President Obama for increased food stamp enrollment and his poll numbers amongst Republicans would go up. It is inexplicable to the point of bizarre. Do yourself a favor and read the whole thing. Not to be outdone, Scott Ott (he of PJ Media and ScrappleFace) uses both insightful commentary and biting satire to illustrate why he isn't supporting Trump. And as members of a personality cult are wont to do, they often lash out with ad hominem attacks as opposed to substantively answering criticism. Ah, but Mr. Ott is perfectly capable of using levity in those situations as well. Now if only the likes of Ted Cruz and Marco Rubio would mirror such takedowns. President Barack Obama will soon be nominating someone to replace deceased Supreme Court Justice Antonin Scalia. There's been boundless speculation as to whose name will be called, but it seems rather moot given that Senate Majority Leader Mitch McConnell has already stated that the next President should fill the vacancy. OK, I'm obviously being facetious here given that the "news" outlets I cited were satirical sites ScrappleFace and The Onion. But given the fact we live in a country where the most dominant male triathlete of the 1970s considers himself a woman, can we possibly rule anything out? In what is the first Sunday after the official end of the NFL season, the Northern Alliance Radio Network soldiers on. Today's edition of my radio program The Closer will air from 2:00 pm until 3:00 Central Time. I pretty much had my entire show planned out by Friday evening, but huge breaking news on Saturday afternoon put a crimp in much of those plans. Obviously I'll discuss the sudden death of U.S. Supreme Court Justice Antonin Scalia and how this affects the political landscape. As such, political wonk Matt Mackowiak responded to my emergency bat signal and will join the program right at 2:00. If time permits, I'll also look back on the week in presidential politics as well as some local political news. At the risk of overstating the impact of just one person's death, let's just say this particular passing will have a ripple effect across all three branches of government and our political landscape. Supreme Court Justice Antonin Scalia, the intellectual cornerstone of the court’s modern conservative wing, whose elegant and acidic opinions inspired a movement of legal thinkers and ignited liberal critics, died Feb. 13 on a ranch near Marfa, Tex. He was 79. The cause of death was not immediately known. Given that so many Supreme Court decisions are decided by 5-4 margins, the vacancy left by Scalia's passing already has battle lines being drawn. Since Barack Obama will still occupy the Oval Office for the next 11 months, it is his prerogative to put forth a nominee to replace Scalia. Given his track record of submitting lefty justices like Sonia Sotomayor and Elena Kagan, it's pretty much a forgone conclusion he'd prefer to nominate a legal mind of their same ilk. But this time Obama doesn't have the luxury of a Democrat controlled Senate to rubber stamp such nominees. Yes, for all the scathing criticism heaped upon Senate Majority Leader Mitch McConnell and the GOP majority in their first year in charge, they have ample opportunity here to cover a multitude of sins. So if McConnell's initial statement on Scalia's passing is any indication, the Senate Republicans may yet be redeemable. Now whether this means McConnell and Co. will simply block nominees or actually go through the confirmation hearing process and then vote down said nominees is anybody's guess. There's part of me that believes that this is McConnell's attempt to force Obama to put up a relatively moderate choice more in the motif of Anthony Kennedy as opposed to a Sotomayor or Kagan. But given the 7-year track record of the White House's current occupant, he seems to believe he's a ruler as opposed to head of an executive branch of government subjected to checks and balances. As such, I don't see Obama cooperating with McConnell and the Senate GOP majority. There's some speculation that McConnell's actions (should he stand firm) would threaten the GOP majority in the Senate come November 2016, particularly Republicans seeking reelection in blue/purplish states (i.e. Ron Johnson in Wisconsin, Pat Toomey in Pennsylvania, etc.). So even if a Republican were elected President, he would likely be unable to get his nominee of choice past a Dem majority in the U.S. Senate. However, I feel this particular battle is a hill worth dying on. For all the idiotic shrieks of there being no difference between Democrats and Republicans in today's Congress, the judiciary is one area where the contrasts are stark. Is this not the perfect metaphor for the ideology of a certain septuagenarian socialist running for President? 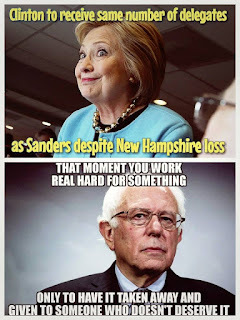 Hillary Clinton is expected to leave New Hampshire with just as many delegates as Bernie Sanders, even after he crushed her in Tuesday’s presidential primary. Sanders won 15 delegates with his 20-point victory Tuesday while Clinton won nine. But Clinton came into the contest with the support of six superdelegates, who are state party insiders given the freedom to support any candidate they choose. Superdelegate support is fluid, though, so some of those delegates now backing Clinton could switch to Sanders before the Democratic National Convention in late July. But as it stands, the superdelegate support gives Clinton a total of 15 New Hampshire delegates. National Review's Jim Geraghty summed it up perfectly: "No Party With ‘Superdelegates’ Gets to Lecture Me About Disenfranchisement." While much of the country was focused on the presidential primaries in New Hampshire on Tuesday evening, my attention was divided between there and my home state of Minnesota. In the state senate district where I reside, the GOP candidate in the special election, Jim Abeler, won handily with 74% of the vote. Democrat Roger Johnson finished with 22% while the Legal Marijuana Now (yes, that really is the name of a political party here) candidate got 4%. None of that was a surprise in what is a solid red SD. On the other end of the Metro area, a special MN House election took place in House District 50B (Southeast Bloomington), a district where Gov. Mark Dayton won by double digits in 2014 and President Barack Obama emerged victorious by a similar margin in 2012. But in this race, GOP candidate Chad Anderson edged DFLer Andrew Carlson by 2.5%! Granted this is only a special election and the seat will be up again in November, but this proves that all bets are off in circumstances like this (looking at you, 46A!). From what I've been told, this gives the GOP their largest House majority in about 10 years. Again, it's only for this one legislative session (which begins next month), but it feels good for Republicans to pick up a seat in Hennepin County once in a while. Nationally, the winners in the presidential primaries (Donald Trump for the GOP, Bernie Sanders for the Dems) were as expected. However, the significant margins of victory were certainly eye opening. On the Republican side, Trump finished nearly 19 points ahead of John Kasich. But the most interesting story lines were found in slots 3-4-5. Despite spending oodles of time and money in New Hampshire, Jeb Bush looks to have finished fourth. That's bad enough, but it's even worse when you consider he outspent 3rd place finisher Ted Cruz by about $44 to $1 in NH. And as expected, Marco Rubio's poor debate performance Saturday came back to haunt him as he finished 5th. But the guy largely responsible for wounding Rubio, Chris Christie, finished 6th and thus is not even eligible to participate in the next debate. After such a disappointing finish, Christie stated he's heading back to New Jersey to assess his campaign. This seems to be a precursor to his dropping out this week. Carly Fiorina and Ben Carson (who finished with 4% and 2%, respectively) need to follow suit. On the Dem side, Sanders scored a 20 point over Hillary Clinton. Seems rather ironic that an avowed socialist can post that kind of result in a state whose motto is "Live Free or Die." While it's fun to see the Shrill Hill campaign in chaos, she'll likely rebound with a resounding victory in South Carolina on February 27. Huh. I guess defense really does win championships. The Denver Broncos, who entered the postseason as the top ranked defense in terms of yards allowed, won Super Bowl 50 over the Carolina Panthers 24-10. The performance of the Broncos' D was that much more impressive when you consider they held in check a Panthers squad which had scored 80 points in two postseason games and was the NFL's top scoring team in the regular season. - If Vikings' coach Mike Zimmer was watching, he had to feel pretty encouraged. After all, the Broncos won that game with stellar defensive play while putting forth (to be generous) pedestrian offensive production. That was much of the Vikes' 2015 season in a nutshell. - Broncos quarterback Peyton Manning likely played his last game. If so, his Hall of Fame career ends the same way his boss John Elway wrapped up his playing days: a Super Bowl champion. There's debate whether Manning should be considered the greatest QB of all time now that he has multiple Super Bowl wins. While I greatly admire and respect the myriad pass records Manning holds, I am not of the opinion that he is the top QB of all time (I maintain that's a battle between Joe Montana and Tom Brady). Let's face it: with that Broncos' defense, Cooper Manning could have been quarterback of that team and still won it all. - After three blowout losses in the Super Bowl as Broncos QB, Elway finally broke through with a win in SB 32 against the Green Bay Packers. Upon finally getting that elusive Super Bowl victory, Broncos owner Pat Bowlen exclaimed "This one's for John!" and handed the trophy to Elway. So when Elway (now the Broncos' VP of Football Operations and GM) received the SB 50 trophy Sunday evening, he returned the favor by saying "This one's for Pat!" It was an especially poignant moment since Bowlen was not present. The Broncos owner stepped away from his day-to-day duties 18 months ago due to being diagnosed with Alzheimer's. - Hey Eli, how do you feel about no longer owning the most Super Bowl rings in the Manning family? -Panthers QB Cam Newton has been receiving a lot of heat for his rather curt post game presser where he eventually stormed off in frustration. Sorry, but I can't get too worked up about it. Obviously the expectations were high for the league MVP and his team to win. But the Panthers didn't get it done, so obviously Newton was still pretty downtrodden less than an hour after the game. Could he have handled it better? Of course. But I don't think it's worth the invective that was directed towards him on social media. - Overall, the renown Super Bowl commercials were pretty lackluster. However, there was one ad in particular which prompted the National Abortion Rights Action League (NARAL) to put out one of the more bizarre tweets of the evening. For the first time in four years, I will be in the Patriot bunker on Super Bowl Sunday. Yes, the one-hour edition of The Closer will kick off at 2:00 PM Central Time. At 2:15 I'll be chatting with Ed Gillespie, who served as chair of the Republican National Committee from 2003 until 2005 and was a candidate for U.S. Senate out of Virginia in 2014. Mr. Gillespie will be on talk about his insistence that any GOP candidate for President will be doomed if they support a carbon tax. Then at 2:30 I'll be joined by Kathryn Karg and Tiffany Buszta from the Miss Minnesota organization. These ladies will be on to promote the annual "Tracie's Night" gala, which is a fundraiser for the Tracie Joy McBride Scholarship Fund. These scholarships are given to young ladies displaying exemplary service in their respective communities. In our 11th installment of Super Bowl prognostications, the Super Bowl Inquisitor supplies the inquisition while I (hopefully) supply some original repartee. It's the same old deal, except we've eschewed using Roman numerals to number the Super Bowls. With that, let's get it on. Super Bowl Inquisitor: As always, let’s start with the tedious questions. Lady Gaga is slated to sing the national anthem. Does that do anything for ya? Brad: It’ll be interesting to see if she can perform a song without any of those kooky techno beats. SBI: I can’t speak for you, but I’m excited about Coldplay being the headliner for the halftime entertainment. SBI: Man. I teed that one up for ya. OK, now to the on field play. Do you believe this will be Peyton Manning’s final NFL game? BC: I hope so. I haven’t seen such a significant 2-year drop off in a professional’s latter stages of a career since Clint Eastwood went from Gran Torino to Trouble with the Curve. SBI: The Broncos’ defense was fantastic against Patriots quarterback Tom Brady in the AFC Championship Game. Can they replicate that success against Panthers QB Cam Newton? BC: I picture the Broncos’ D attempting to sack Newton as being similar to the efforts of the Lilliputians trying to bring down Gulliver. SBI: Are you offended by Newton’s “dabbing” whenever he makes a big play? SBI: There’s typically a scandalous off field story during Super Bowl week, with this one being no exception. Broncos’ safety Ryan Murphy was sent home after being arrested in a prostitution sting. Your thoughts? BC: I’d prefer you ask Panthers’ radio guy Eugene Robinson for *his* thoughts. SBI: What’s on the menu at your Super Bowl get-together? BC: Hors d’oeuvres, shmor derves. Keep it simple. We’re going with Devil Dogs, a veggie tray and a vast array of diet sodas. SBI: The Panthers are a 5-1/2 point favorite over the Broncos. How ya callin’ this one? BC: It’s hard to believe that a Peyton Manning led team merely needs him to be a “game manager” but that’s where we are. I think the Broncos’ defense will hold their own against Cam & Co., but Denver’s offense will be rendered ineffective. I’m going 21-17, Carolina. Today I will be joining my friend and Northern Alliance Radio Network colleague Mitch Berg on his Saturday broadcast, live from 1:00 until 3:00 PM Central Time. 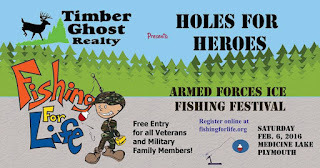 As has been the tradition the past five years or so, the NARN ventures out for a broadcast on Medicine Lake in Plymouth, site of the annual Holes for Heroes ice fishing tournament. This fantastic event honors those serving in our Armed Forces as well as the family members who are also making a tremendous sacrifice. As far as the show is concerned, Mitch and I will likely chat with some of the key figures who help make this ice fishing tourney such a success. If time permits, we will also delve into some of the news from the presidential campaign trail. So please give us a call at (651) 289-4488 if you'd like to weigh in on any of the topics we plan on addressing. And to think I was enthusiastically supporting the idea of my favorite NFL squad drafting this guy in 2014. Johnny Manziel's time with the Cleveland Browns will come to an end in March, according to a league source. The Browns released a statement from new director of football operations Sashi Brown on Tuesday that expressed disappointment in Manziel but stopped short of saying the quarterback's run in Cleveland is over. "We've been clear about expectations for our players on and off the field. Johnny's continual involvement in incidents that run counter to those expectations undermines the hard work of his teammates and the reputation of our organization," Brown said. "His status with our team will be addressed when permitted by league rules. We will have no further comment at this time." The reference to league rules points to the fact that the Browns do not have the salary cap space to release Manziel on Feb. 8, the day after the Super Bowl and the first day they can do so. The move will take place when the new NFL year starts March 9, according to the source. Releasing Manziel in February would count $4.6 million against the cap, and due to the cap's machinations, the Browns do not have that space -- and will not have it in February. The cap will increase in March, which will allow them to release Manziel then. With the Vikes having the #8 overall pick in 2014, I figured it would come down to either Manziel or LB Anthony Barr. But then the Vikings swapped picks with the Browns, giving Cleveland the #8 spot in exchange for #9 overall as well as the Browns' 5th round pick. So when Cleveland took a cornerback with that selection, I still wasn't sold Manziel would be the guy even though he was there for the taking. The reason I felt that way was because it had been reported that new Vikings coach Mike Zimmer expressed serious concerns about the quarterback's off field issues. In the end it was apparent Zimmer wasn't bluffing as the Vikings took Barr at #9. I think we can safely say that was the absolute perfect move. A career that started with immeasurable excitement at the Browns trading up to draft Manziel ended with fans and the team ready to move on. Manziel is likely to rank as one of the Browns' biggest draft disappointments. Manziel had a rocky rookie season that ended with him missing the final walkthrough after he was out late the night before the team flew to Baltimore. Manziel checked into rehab and treatment for undisclosed reasons shortly after the season and spent 10 weeks at Caron Treatment Center outside Reading, Pennsylvania. He returned promising to tamp down the hype and keep himself off social media and out of the news. He did so until mid-October, when police in Avon, Ohio, questioned him after his then-girlfriend said he had hit her while driving in a car. That led to a spiral of appearances on social media that troubled the team -- and briefly cost him a starting job. Manziel returned for three of the final four games when Josh McCown broke his collarbone, but the week before the finale showed up late to a Wednesday team meeting looking disheveled. The team got him out of the meeting room, then announced he was in the concussion protocol. USA Today then reported Manziel was in Las Vegas the weekend of the Browns' finale. He missed a scheduled treatment for his concussion the morning of the finale. More social media appearances in clubs followed, and last weekend police were called for an alleged assault in Fort Worth, Texas. Dallas and Fort Worth police are investigating, as is the league. The only question remaining is if this is Manziel's "rock bottom." People with addictions often have to reach that low point before they bounce back. If Manziel has yet to bottom out, perhaps a season or two with the Ottawa Redblacks would do it. The Iowa Caucuses makes for good theater if you're a political junkie like me. But in the end, it's analogous to the third NFL preseason game where teams play their starters the majority of the game to effectively gauge how they measure up, and that a loss is not necessarily a death knell. On the Republican side, Ted Cruz emerged victorious, securing 28% of the vote. Perhaps the most surprising development of the evening was Marco Rubio almost overtaking Donald Trump for second place. Trump eked out the second spot 24%-23%. Meanwhile, the Democrat side featured pretty much a dead heat between Hillary Clinton and Bernie Sanders. And despite a solid one point victory over "Uncommitted," former Maryland governor Martin O'Malley chose to suspend his campaign. As a result, the average age of the lily white Democrat candidates for President of the United States is now 71-years old. - It's become pretty clear over the past month that the GOP side is a three candidate race among Cruz, Trump and Rubio. However, it appears only Mike Huckabee has the foresight to suspend his campaign. With a disappointing 5 % showing in Iowa, can Rand Paul be far behind? And even though Jeb Bush and John Kasich continue to be non-factors, both seem somewhat emboldened by either a surprising rise in the New Hampshire polls (Jeb!) or endorsements from prominent northeastern and east coast newspapers (Kasich). 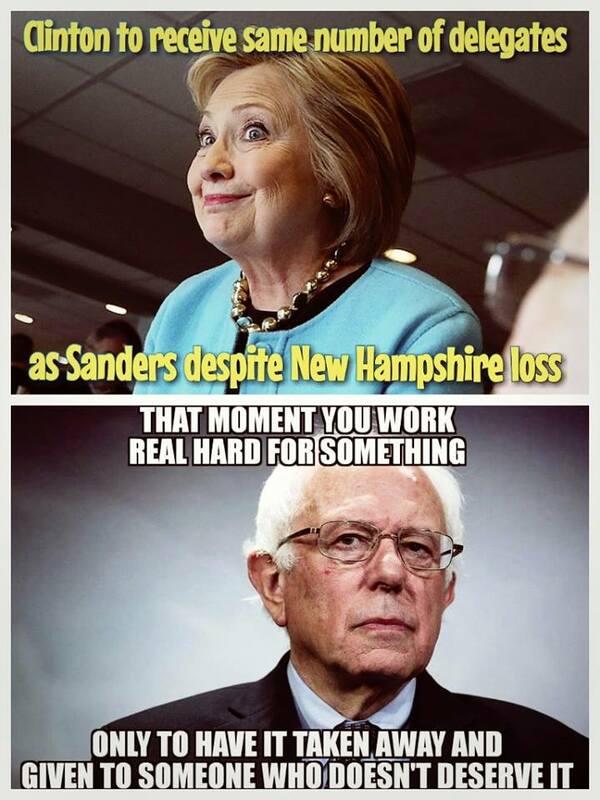 Hopefully both will be humbled by resounding defeats in New Hampshire next Tuesday. - Clinton epitomizes the Democrat establishment and has limitless resources at her disposal for this campaign. So what does it say about her "unfavorables" when she is receiving a legit challenge for the Dem nominee from a kooky, 70-something avowed socialist? Leftists love to engage in concern trolling over the GOP being "too extreme" and how Ronald Reagan couldn't even win the presidential nomination in today's Republican party. Classic projection on the Dems' part since they probably know deep down that a John F. Kennedy type wouldn't be a contender in today's Democrat party. - While I've made no secret of my opposition to Trump, I have no delusion that he's finished despite his disappointing second place finish. With that said, I believe Trump should have put his electoral viability to the ultimate test by enacting the Howard Dean scream at night's end. Alas. A little more than one year ago, Wisconsin governor Scott Walker gave a riveting speech at the Iowa Freedom Summit. Given that this occurred a mere two months after winning his third statewide election (including the July 2012 recall) in four years, said speech fueled speculation of a presidential run. A year ago, there was an air of not "if" but "how big a margin" Walker wins in Iowa. But as we were less than 24 hours from caucus night, someone who was once considered the most viable GOP presidential candidate had been out of the 2016 race for four months and was tweeting about some vapid TV show. I'm still not over it.